Ben Wheatley has always been an adventurous director, willing to push the boundaries of cinema to create an experience unique to the medium, imbuing the work with an original and often eccentric touch, he isn’t afraid to play with the techniques at his disposal, and experiment with just what he can achieve in certain limited situations. 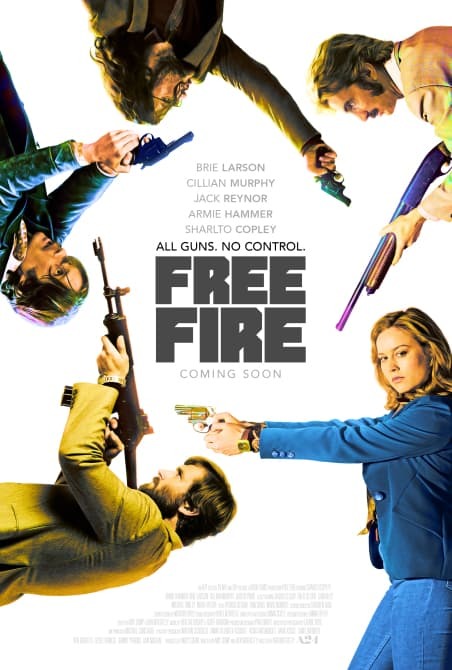 Free Fire is an example of his ability to flourish in one such restricted environment, confining the vast majority of the film to a warehouse and successfully crafting a film that is very funny, incredibly clever and consistently engaging. 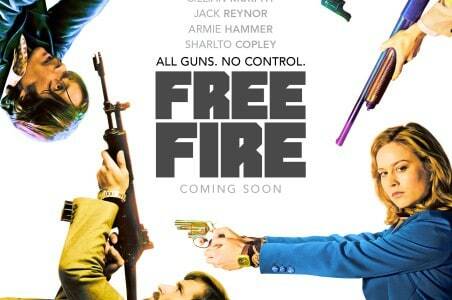 Free Fire follows the progress of two groups of people as they seek to make a gun deal in Massachusetts. Chris (Cillian Murphy) and Frank (Michael Smiley) are IRA members seeking to complete the purchase of guns they had ordered, utilising the services of Stevo (Sam Riley), a junkie who has been paid to transport the weapons and meeting with an intermediary, Justine (Brie Larson). She arranged a meeting with arms dealer Vernon (Sharlto Copley) and his representative Ord (Armie Hammer), in an abandoned warehouse where the deal will take place. What should be a simple transaction quickly goes awry though, in hilarious, ridiculous fashion. Wheatley gets excellent performances out of his talented ensemble cast, all of whom get the chance to showcase their talent and come through with flying colours. Particular recognition goes to Sharlto Copley and Sam Riley for their excellent performances, but as a whole the cast is a well-oiled machine, something that only helps when the director is trying to put together something as intricate as this. The epic gun fight is excellently managed, and Wheatley uses his actors to play up the farcical situation that his characters find themselves in, all while making sure that the real stakes are still prevalent, ensuring that events don’t lose their gravity or sense of importance. The film also manages to play with genre conventions in order to subvert expectations, and there is a sense that it could have gone in a completely different direction if things didn’t escalate out of control after the first fifteen minutes. There lies Wheatley’s genius, as he almost sets up a more complicated, intricate plot before bringing it all crashing down, a disagreement between two of the characters leading to complete anarchy and meaning that the innocuous warehouse that could merely have been a brief stopping point in a more intricate film becomes a place each character unwittingly comes to be very familiar with. The gun fight itself is farcical in the best possible way, shots rarely finding their mark and often only causing flesh wounds when they do, resulting in most of our characters crawling around their vicinity trying to make sense of the situation and get their own back at the same time. An example of a film that takes some standard genre conventions and twists them in an interesting, humorous and engaging way, Free Fire is another example of director Ben Wheatley’s ingenuity, and his script, co-written with long-time collaborator Amy Jump, is the glue that holds the film together, reveling in the film’s ridiculousness. As a comedy, it’s totally successful, and as an action film, it holds together well, though the comedy is what makes it a total success.